There’s no doubt about it, fermented foods have become a bit of a buzzword recently. It’s a funny turn of events really, given that people have been using fermentation for thousands for years to preserve food and drinks naturally, without refrigeration. But why the sudden revival of such an ancient practice? Surely fermentation is a bit old school; something your granny might have done to eke out the family’s war rations? In places where access to electricity is more difficult, such as in remote rural areas of less developed countries, being able to keep food edible for longer is very important. But What Place Do Ferments Have In This Modern Age? Preservation isn’t the only benefit to be gained from this age-old form of food preparation – fermented foods also pack a powerful nutritional punch. Fermented food and drinks have been part of our diet in a big way: in the UK that includes some breads and cheese, chocolate, alcohol and yogurt. However, many of these products are pasteurized before they reach the consumer, which kills off the good bacteria and nullifies their nutritional potential. Thankfully, other non-pasteurized fermented products can be found in shops more easily now, such as the fermented cabbage ‘sauerkraut’ popular in Germanic countries and the drinks kombucha and kefir. Even better, they’re all pretty easy and cheap to make at home. Across Asia, fermented foods are eaten on a daily basis. The Koreans are so mad for their spicy national dish Kimchi they have 180 different varieties. In India you can fill up on dosa pancakes, idli dumplings in the south and lassi drinks. The Japanese love their pickled veg, umeboshi plums and miso paste and the Thais liberally use nam pla fish sauce in almost everything. And let’s not forget all the fermented soy products such as tempeh (best made form organic soy beans) and the myriad types of soy sauce consumed worldwide. 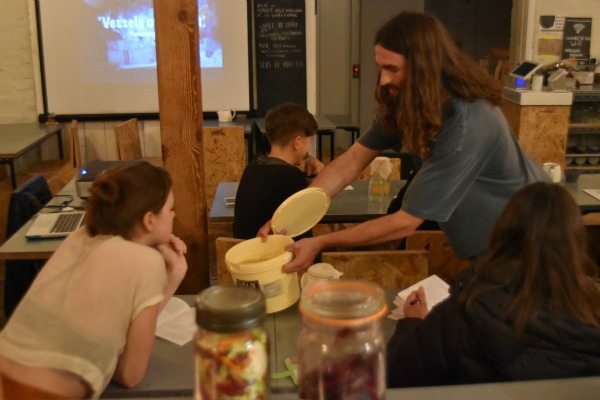 Curious to learn more, I booked myself onto a workshop run by local food activist and ‘fermentivist’ Darren Ollerton of Octopus Alchemy, who works with communities through health education, ‘political nutrition’ and traditional foods. 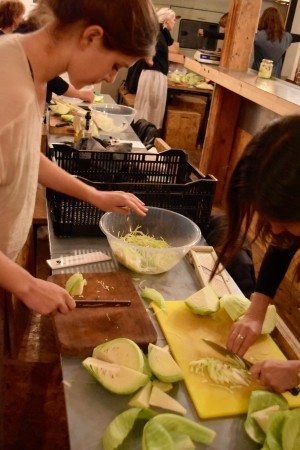 The location for the workshop is Silo on Upper Gardner Street; a perfect setting considering Silo’s core ethos and ‘pre-industrial food system’ philosophy. Darren is similarly qualified to be our host for the evening: while doing his BA (Hons) degree in Politics and Sociology he focused his research on the relationship between ‘alternative’ medicine and mainstream Western medicine and the role nutrition plays in wellbeing – a subject that’s dear to his heart and gut, as it turns out. Darren tells us he discovered fermentation while dealing with a health condition that was poorly understood and exacerbated by clinical medicine, which he himself greatly relieved through nutrition and an alternative approach. Darren builds on his personal story by telling us how indigestion problems are particularly high in countries where fermented foods are eaten minimally; where numerous people exist on a diet of cheap mass-produced processed food loaded with artificial colours, flavours, preservatives, sweeteners and unhealthy fats; all designed to make food and drinks look and taste palatable but at a far costlier price to our health and wellbeing. Add to that the fact the air and water supply contain numerous chemicals over which we have no control, and soil isn’t as as mineral rich as it once was. Mass use of pesticides, such as glyphosates – the world’s most widely used weedkiller – has contaminated soil, crops but also staple food products. In short, our bodies are under constant attack from a barrage of toxins and whatever we breathe, drink or eat has to be processed by our digestive system. It’s not surprising so many of us experience chronic and crippling digestion problems. Gut health is fundamental to wellbeing, and fermented foods give our bodies the support we need to cope in modern society by restoring inner balance. Microbes in the gut form complex webs that support proper cognitive, immunological and physiological health and fermented foods help to bolster and support these precious ecologies. All fermented foods and drinks provide more available vitamins and minerals than in their original state – a fact I find astonishing and wonderfully exciting. Darren explains this in clear, concrete terms. 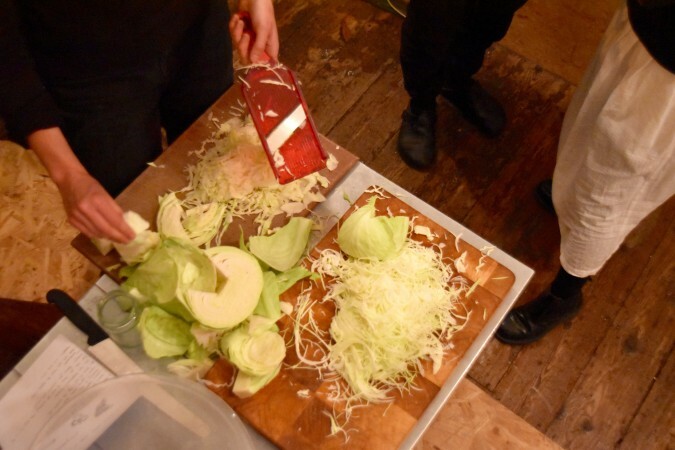 If two people were each given a cabbage and one was fermented while the other left raw and fresh; the fermented cabbage would be much more nutritious than the other. 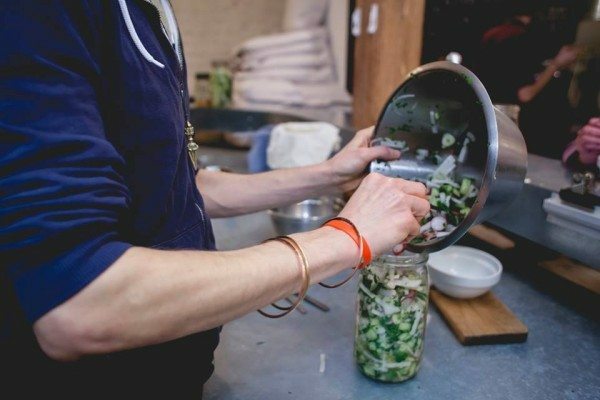 So fermentation is an activity that not only preserves food and ramps up the good bacteria and nutrients, it can also help address food poverty. A little bit of food can be made to go much further. To illustrate all of this, Darren shows us a charming and inspirational film about a chap called Sandor Katz, who’s done a lot to ignite the current fermentation renaissance. Sandor’s knowledge – and Darren’s too – is wide-ranging and contagious. The enthusiasm in the room from all of us fermentation newbies is growing by the minute! When you ferment vegetables, for example, you coat them in salt or soak them in a brine of salt and their own juices (or salt water) and then press the vegetables down, so they’re submerged in the liquid, which creates an anaerobic atmosphere which kick-starts the process of “lacto-fermentation”. The ‘lacto’ part of the name refers to a specific species of friendly bacteria called lactobacillus present on the surface of all plants, especially those close to the ground. These good bacteria gobble up all the sugars in the vegetables and produce lactic acid as a byproduct – a natural preservative that inhibits the growth of harmful bacteria and gives fermented foods their sour, funky taste. During fermentation, whatever food you’re using is broken down into a more digestible form and the existing nutrients preserved. Also, along the way a whole host of b-vitamins, omega-3 fatty acids and various strains of probiotics (healthy bacteria) are created; all of which are highly beneficial to our body’s own digestive health. By this time I feel fully motivated and heartened by all I’m learning. With ancient food practices like fermentation at risk of disappearing, the very act of fermenting is a significant political act. Darren recommends including fermented food and drinks in your diet each day but build up to that slowly, as they’re very saline and potent. Some people don’t do well on fermented foods because of conditions like gut dysbiosis or small intestinal bacterial overgrowth (see Natasha Campbell-McBride’s book Gut and Psychology Syndrome). We move to the kitchen area and Darren tells us about the importance of ghee as another ancient food and practice. Also known as clarified butter, ghee is a very pure fat with a very high smoke point. Like coconut oil, it’s rich in vitamins. It’s also good carrier for medicinal herbs and helps to balance the body in times of stress. You can eat a spoonful of it to help calm down your system if you’re feeling adrenalized, plus it’s used in cooking, eaten as a spread or as part of a salad dressing – however you like it – but as with all other ferments, it’s only has good as the basic ingredients with which it’s made so get grass-fed organic butter not grain fed. He demonstrates how easy it is to make – and while the butter is bubbling away on the hob moves onto his pickled vegetable ferments, which we all try before he shows us one by one how to make: an incredible South African sweet potato pickle, a zingy salsa, a tangy tomato ketchup and finally, a spicy kimchi which we all have a go at making ready to take a pot home. We all leave the workshop buzzing; socially and politically inspired as well as nourished. 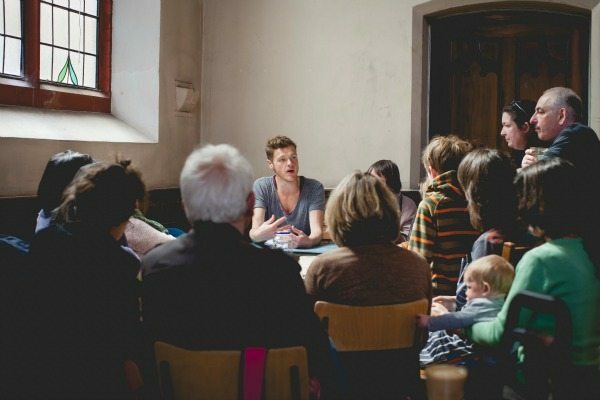 If you’re interested in supporting his work, go to one of his workshops and contribute to his new crowdfunding campaign. He’s raising money to buy more equipment as part of a collaborative project with Silo and The Real Junk Food Project to transform the city’s food waste into superfood. You can read more about this innovative scheme here.